1. Blend all of the ingredients together, taste and adjust to your liking. 2. 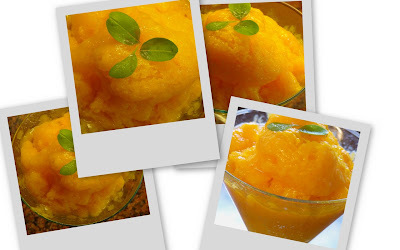 Pour the sorbet into a freezer-proof container and put it into the freezer. 3. Now here is the toughest part of this recipe: don't forget to whisk it once in a while to break the crystals. Check on it in a couple of hours at first, but then you will have to whisk it every hour till it sets completely. 4. After that, you can leave it in the freezer overnight or have it on the same day after it sets completely. When serving, garnish with fresh basil leaves - it's an amazing combination of flavours! *If you cannot buy fresh mango pulp, pure fresh mangoes in a blender. **If you cannot get fresh ginger paste, mince a piece of fresh ginger super finely.